It’s time for politics again! As you know, I ran for Dallas City Council in spring of 2017. And now, once again, its an election year! If you look around, every principle platform I campaigned on — police and public safety, fixing our roads, putting the Trinity Tollroad to rest, and putting Fair Park on the road to a better future, has been top news. 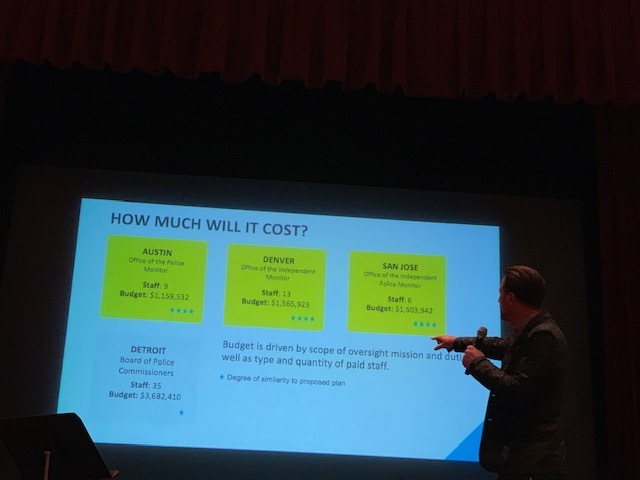 Austin fixed the police and fire pension as best they could, but Dallas remains in a critical understaffing mode of public safety officers while police response times are diminishing. Miraculously, the police pay lawsuit was settled. January 1 this year, DPD starting salary was finally raised to a decent $60,000. And now, with the department understaffed, with morale low after years of fighting City Hall, the Dallas City Council is considering putting more teeth into the citizen staffed Dallas Police Review Board. 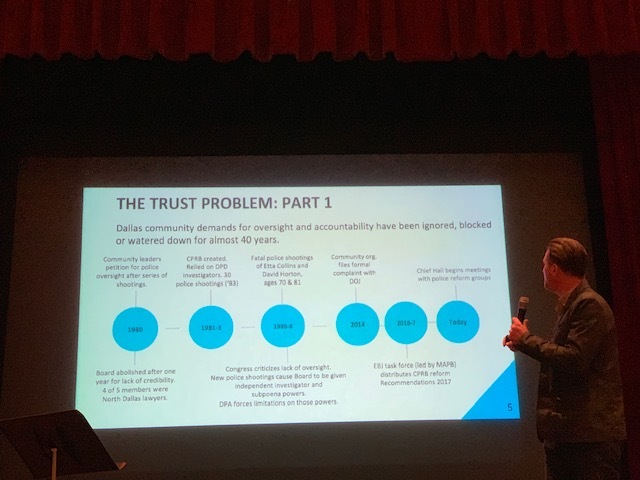 I spent hours last Tuesday night listening to the traveling education presentation for the tougher Dallas Police Review Board, on which District 11 has no current appointee. The story published on CandysDirt.com under the category of crime and Real Estate. You can find it here, and I’ll publish it below. But this blog is my place for voicing political opinions, so here we go: I think implementing this “get tough” board is a very bad move for our city right now. Very bad, indeed. I understand: not everyone views the police the same way I do. There are serious problems of targeting minorities. I remember how worried I was when my son was a teenager. Black mothers worry even more: will their sons get shot by police? I understand there are some unscrupulous police, just as there are unscrupulous lawyers, doctors. and teachers. We really need to root them out. But I believe this tough Review Board aims to punish the majority for the work of a few. I believe we should make it priority one to re-build our department and mend feelings before considering anything like this. In fact, enacting this board would just send more DPD packing to other departments, I believe. Dallas pays to train police officers to the tune of about $100,000. 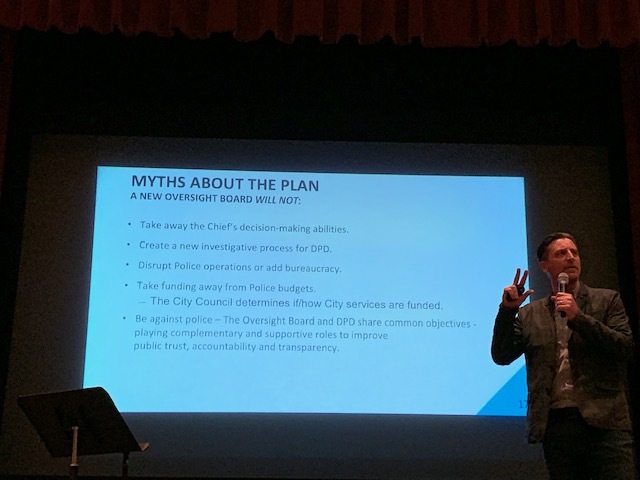 Then they leave to go work for neighboring cities who pay more, have less crime, and do not have civilian-staffed public police review boards. Who can blame them for leaving? 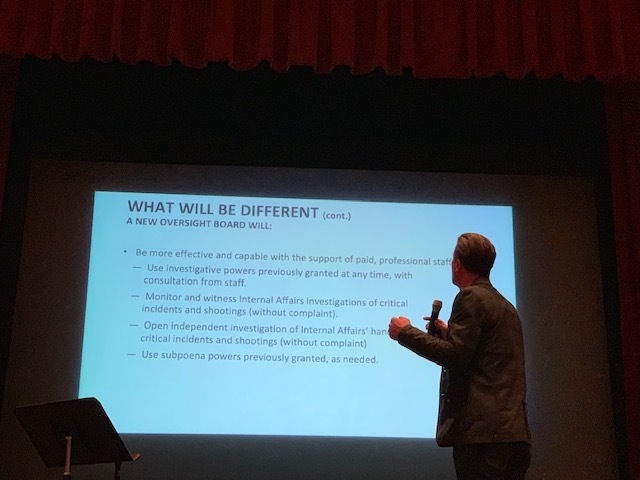 While I’m told the Dallas Community Police Oversight Coalition started working on this board in 2017, the fact is that young Botham Jean’s death at the hands of an off-duty Dallas officer IN HIS OWN HOME fast-forwarded the creation of this board. So in two years, little work has been done, not nearly enough to repair relations with police, staff them, train them, retain them. 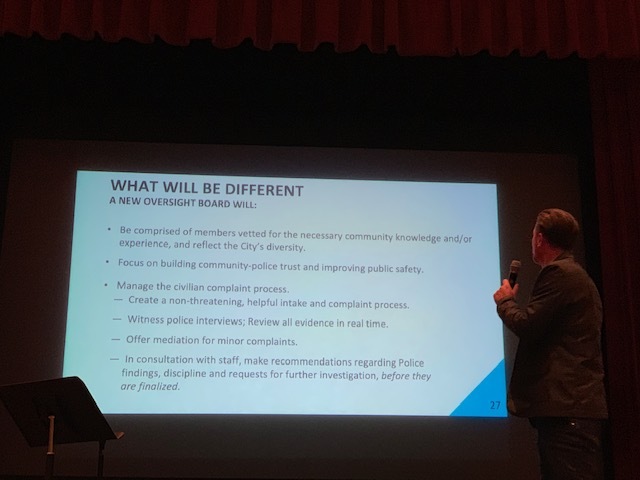 We know the City of Dallas is aiming to strengthen its Citizens Police Review Board, the entity which examines alleged inappropriate police behavior within the Dallas Police Department against citizens. In fact, I am fairly certain this is a done deal and will happen within the next two to three months. 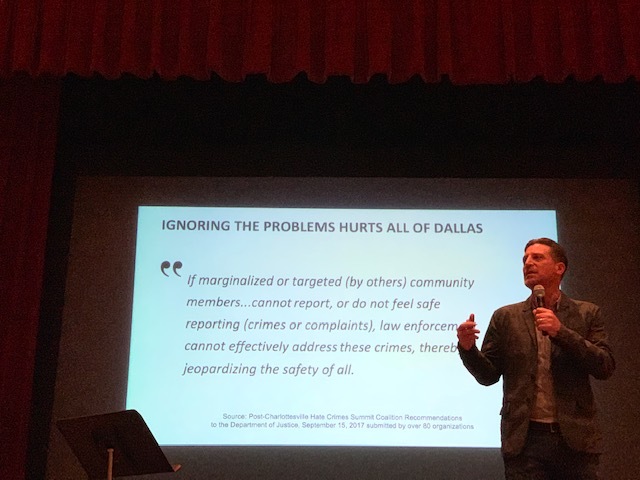 In fact, we were told that Dallas has far fewer complaints against police than other cities of similar size, which the board said was because many people in Dallas are afraid to say anything negative about police. (I’m told there wasn’t even a form to fill out.) 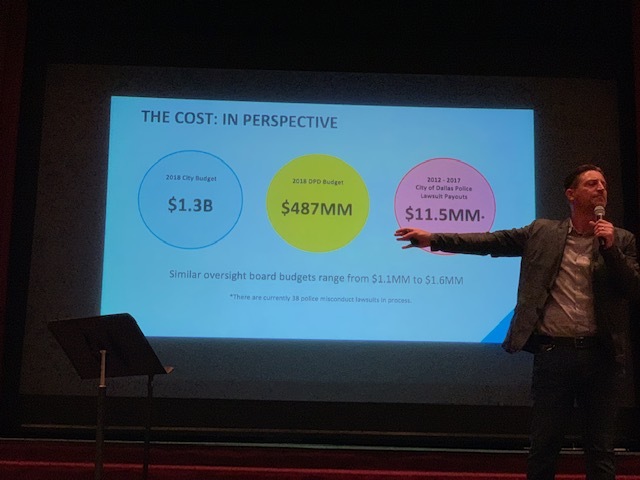 Some even at the meeting didn’t know the board existed. 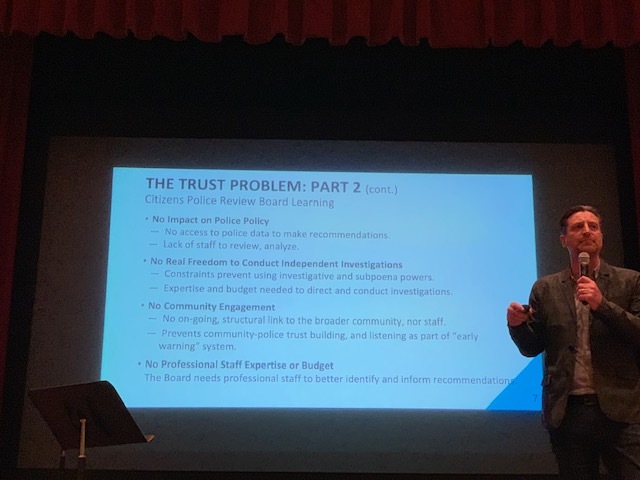 The CPRB representative, Paul Hille, filling in for chair Dr. Brian Williams (appointed by Mayor Rawlings), had to explain to the large, mostly police friendly group, that not everyone considers the police friendly. I daresay a vote for police pay raises in this group would have been a slam-dunk. The meeting was well-policed, including the presence of Police Chief U. Renee Hall. Gateway Church offered a generous smorgasbord of sandwiches, cookies, water, and iced tea. (At earlier meetings in other districts I’m told wine was even served.) 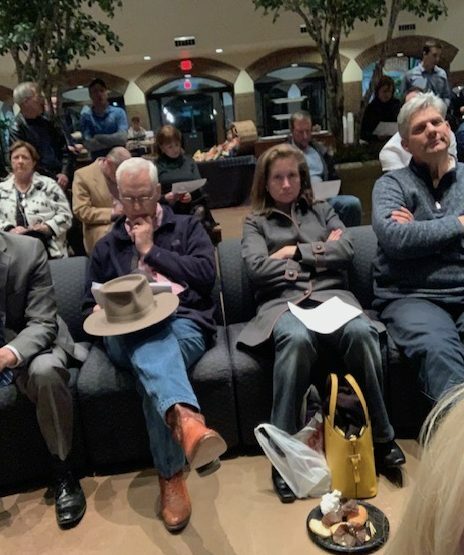 The furniture in the giant room was arranged cafe-style, seating four to a table, and most of us sat on sofas to evoke the feeling we were not at a contentious meeting but perhaps a dinner theater. One of the officers told me that Gateway’s coordinator has a degree in psychology and placed the furniture purposefully so as to provide a calming atmosphere and ordered food for full bellies. 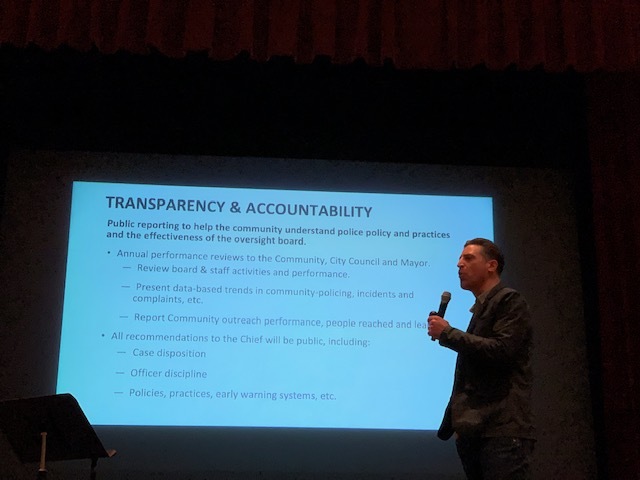 How it works now: the Citizens Review Board, appointed by the City Council, makes recommendations on police investigations and checks that complaints have been handled properly. 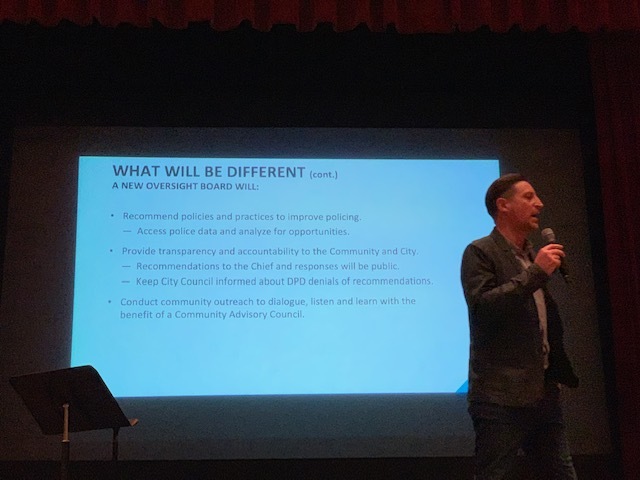 The proposed changes would give the review board investigative powers, a budget, the authority to subpoena officers, and the power to overrule police Internal Affairs investigations. The current board cannot subpoena officers. So, if an officer is involved in some sort of on-the-job misconduct, inappropriate use-of-force situation, or shooting, the current board cannot conduct its own independent investigation of the incident. One young man called attention to the fact that he was black, while most of the people in the room were not. As he began, his speech was initially met by boos until a North Dallas DPD reminded us of decorum and said that anyone shouting out when it wasn’t their turn to speak — which had been happening — would be escorted out by DPD. The young man continued that black people have been unfairly targeted by police for killing, evoking the recent shooting death of a black man (Botham Jean) in his own home by a Dallas police officer. He said something to the effect of, this is why there is a need for this board (whether you realize it or not), you may not be willing to do something about it, but in fact, the black community is going to do something about it whether you like it or not. His speech, very brave actually, had a momentary chilling effect on the room. For a moment, I had memories of watching TV when I was a child, during the 1960’s, as racial wars tore American cities apart. The next crescendo came when the family of the late attorney Ira Tobolowsky spoke, basically detailing how the Dallas Police had botched evidence in the murder of their loved one to the extent that there was now no evidence to convict the suspected murderer. Reading from a three-page hand-typed letter, Mr. Tobolowsky’s relative made a clear case for a mess up of major proportions that began the moment police and fire were called to the scene of the crime in May 2016, at the Janmar home in North Dallas. Those of us listening gasped in horror as the speaker detailed how the family appealed to not one but two police chiefs, David Brown and now Chief Hall: nothing. Later, another woman, whose black son had been killed by police, explained how unfairly targeted black victims’ families feel. Realtor and activist Diane Benjamin detailed how she had been robbed in her driveway but police were there within minutes . (Diane was vehemently opposed to the stronger board and the community groups supporting it.) Another young woman gave details of being mugged in her North Dallas driveway and enduring a 40-minute wait for police, this quite recently. In between those testimonies, most in the vast room were supportive of police, were angered by the understaffing of the department, inadequate police pay compared to neighboring cities, and the overwhelming burdens that our society has tasked police with: being a social worker, a psychologist, a parent, law enforcement officer. And, as we saw in the room, enforcer of civility. By the way, do the neighboring communities who snap up our trained officers have strong police review boards? City comparisons that were made: San Jose, Austin, Denver and Detroit. 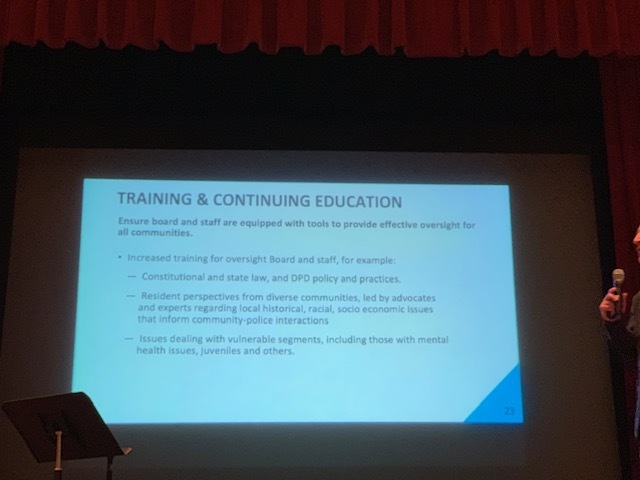 The stronger board would be able to subpoena officers, create an independent investigative arm, implement police policy, and conduct external investigations of complaints from the public to ultimately make recommendations for discipline against officers. Appointees to the board would be “qualified individuals”. I learned that current members of the board are mostly male, many are attorneys or have background in law enforcement. 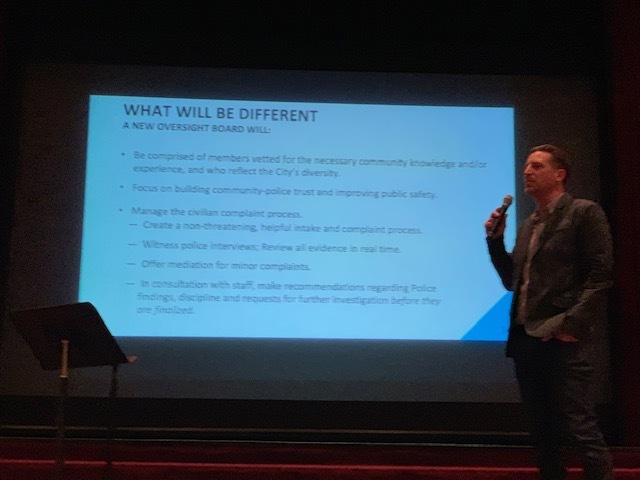 But as District 11 resident Bill Caruth pointed out, decisions about policing would be made by a lay panel, individuals with no training in police procedures: not good. Another suggested that because appointments to the stronger board would come from Council persons, it could get political. Another suggested implementing a smaller scale version first: baby steps. 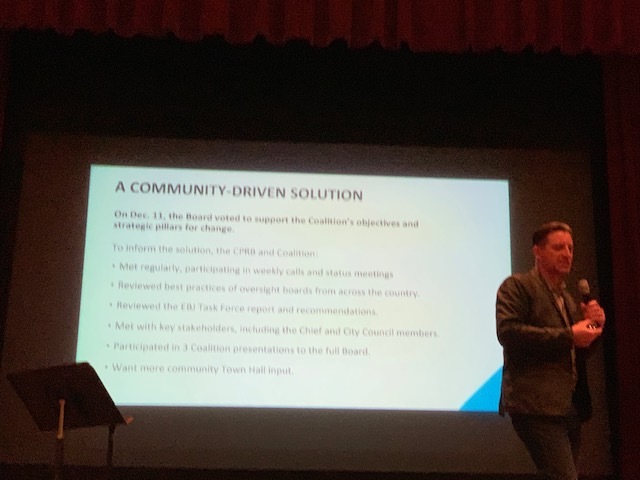 The call for a stronger board originated with City Manager T.C. Broadnax and Dallas Police Chief Reneé Hall in 2017, as they met with a coalition of community groups (Dallas Community Police Oversight Coalition) voicing anger and concern over police behavior. It hit crisis proportions with the death of Botham Jean last September, the young black man shot in his home by former Dallas police office Amber Guyer. 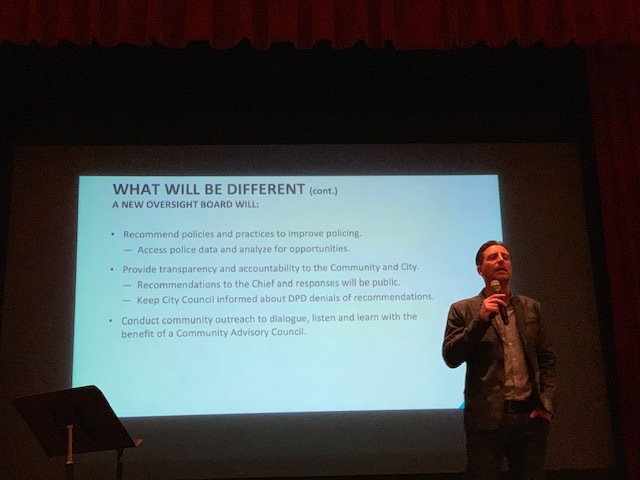 The coalition recommended that citizens have a way to file complaints about officers online and in-person, which now can be done on the DPD website. An early warning monitoring system that, “…allows supervisors to monitor, report, and archive officer actions and improve accountability” is also underway. But the coalition felt true strength would come from citizenry subpoena and investigative powers, and the power to override police Internal Affairs investigations and outcomes. And that is the part that concerned most citizens at Tuesday night’s meetings. Best comment of the evening came from a West Texas man who said he was of Indian origin, hence a member of “the originally mistreated American population”. He said he had always been respectful when stopped by police as a young man. Therefore he had never had problems with police. He said he was concerned with the lack of respect in society for police in effect, and he asked why it wasn’t possible to overlook what was “PC” and work together for the good of America. He voiced concern that if society continues to thrash police, we may have fewer left… as is the clear case in the city of Dallas right now. Though the evening was late, and everyone may have wanted to go home, the applause for his comment might have been loudest. ⟵Is the State Fair of Texas Ripping Off Dallas Taxpayers?